Racially, these are trying times that weigh on our hearts, minds, and spirits! For Black people in particular, incident after incident, including the killing of Stephon Clark and hearing reports that the officers who shot him will NOT be criminally charged, can cause racial stress and trauma. The constant negative social messaging about the inhumanity of Black lives and bodies can lead us to experience pain, anger, anguish, rage, numbness or fear for the safety and well being of ourselves, our families and our communities. Coming together in community with other Black people can provide some sense of safety in times like this, in this increasingly hostile world. Safe Black Space Community Healing Circles create a place where we come together to unburden ourselves; share our feelings, concerns, fears, and hopes; understand the root causes of our challenges; and work on personal and community healing. If you identify as a person of African ancestry and you have been impacted by racial stress and trauma register for this FREE event and bring someone with you. Join other community members, local African American mental health providers, faith leaders from Sacramento Area Congregations Together, educators and others at this Safe Black Space Community Healing Circle designed specifically by us and for us. For more information contact Dr. Kristee Haggins at safeblackspace@gmail.com; visit www.safeblackspace.org; or call (530) 683-5101. 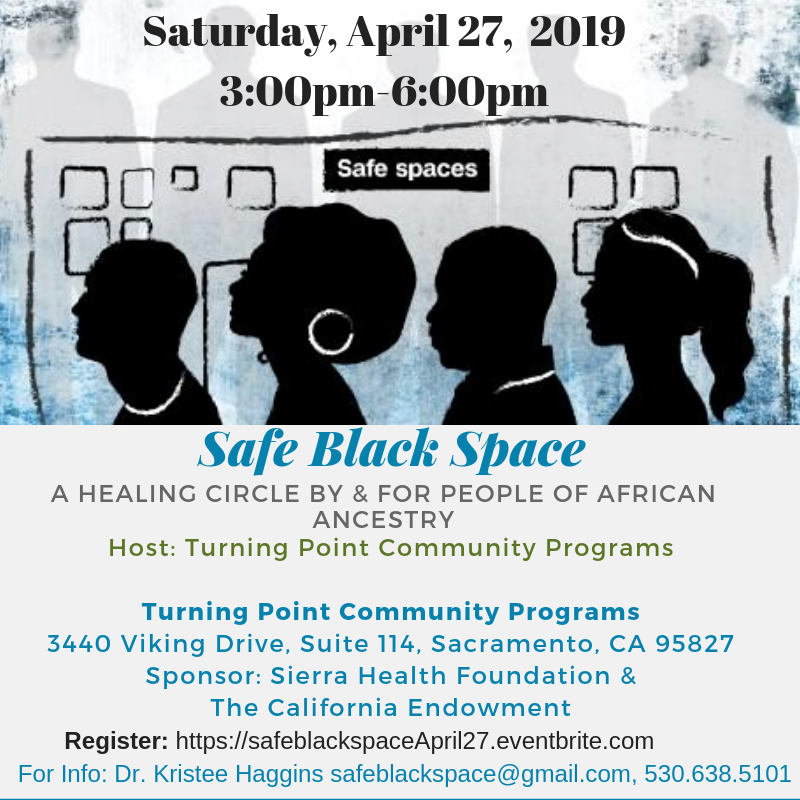 This Safe Black Space Community Healing Circle is hosted by Turning Point Community Programs and sponsored by The California Endowment and The Sierra Health Foundation.